Lodge Brothers of West Byfleet have been remembering the armed forces this Remembrance Day helped by the staff of Brooklands Musuem. 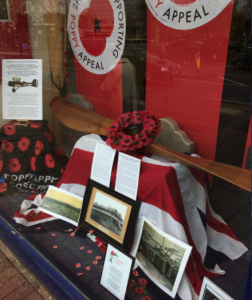 The centre piece of the window was an original propeller from a S.E.5a a British First World War single-seat biplane fighter designed by H.P. Folland at the Royal Aircraft Factory, Farnborough. The plane entered combat on the Western Front in 1917 and was highly successful with the Royal Flying Corps. In total, 5,205 S.E.5a’s were built, 1,650 under licence at by Vickers at Brooklands and a further 258 by Martinsyde in Woking. Many locals called in and thanked Annie for creating such a great display and for remembering the local residents who fought for their country. 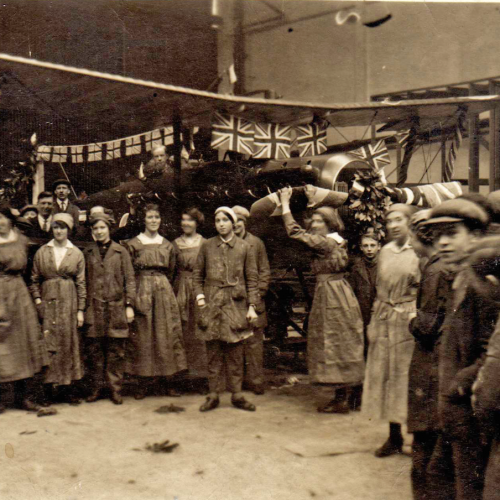 Pictured is the window Display at West Byfleet and also image from the factory supplied by Brooklands Museum showing some of the local workers and a S.E.5a on the production line.